Other Information: You may start to feel relief the first day and full effect after several days of regular, once-a-day use. Store between 39 degrees and 86 degrees F (4 degrees and 30 degrees C). Keep this label and enclosed materials. They contain important additional information. Misc: 60 metered sprays. Fluticasone Propionate (Glucocorticoid) 50 mcg per spray. 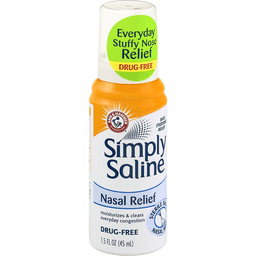 Allergy symptom reliever nasal spray. 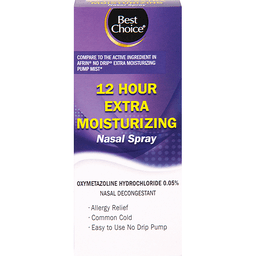 24 Hour Relief of: Itchy, watery eyes; Nasal congestion; Runny nose; Itchy nose; Sneezing. What problems can Flonase Allergy Relief help with? 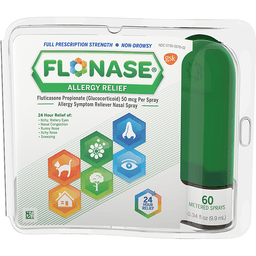 Flonase Allergy Relief helps relieve a broad range of uncomfortable symptoms like congestion and itchy eyes. Nasal symptoms. Eye symptoms. These symptoms can be triggered by allergens like pollen, mold, dust or pet dander. Outdoor allergens. Animal allergens. Indoor allergens. Questions or comments? Call toll-free 1-844-Flonase (1-844-356-6273). Made in Canada. Other Information: Store at room temperature 59-84 degrees F (15-29 degrees C). Misc: Homeopathic. Plus multi-symptom relief. With cooling menthol & eucalyptus. Zinc-free. Shortens colds. The Pre-Cold Medicine: Take at the first sign of a cold. 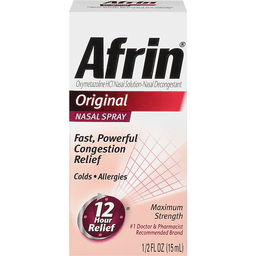 The only clinically proven cold shortening nasal spray. See what's inside. New. 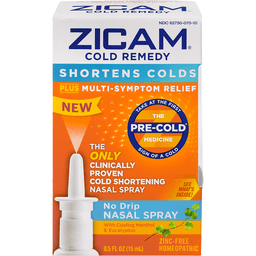 Zicam Cold Remedy was formulated to shorten the duration of the common cold and may not be effective for flu or allergies. The first sniffle, sneeze or throat tickle - you have a pre-cold, the first sign a full blown cold is coming. Take Zicam now - clinically proven to shorten a cold. Go from pre-cold to no cold faster. Satisfaction guaranteed. Questions? Comments? Side effects? Call 877-942-2626 toll free. www.zicam.com. This product is not required to go through the FDA's New Drug Application approval process. With plant-derived active ingredients. Get rid of your cold faster. Other Information: Store between 59-84 degrees F (15-29 degrees C). Retain carton for future reference on full labeling. Misc: Nasal decongestant. Oxymetazoline HCl. 12 hour. Non-drowsy. Soothing aloe vera. 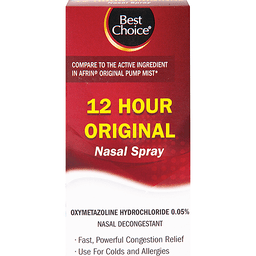 Fast relief of nasal congestion & sinus pressure. Satisfaction guaranteed. Questions? Comments? Side effects? 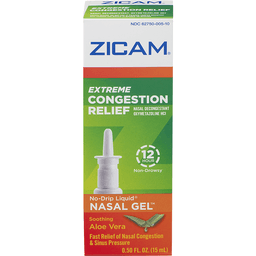 Call 877-942-2626 toll free or visit us on the web at www.zicam.com. Other Information: Store between 59-84 degrees F (15-29 degrees C). Retain carton for future reference on full labeling. Misc: Oxymetazoline HCl. Intense sinus relief. 12 hour. Non-drowsy. 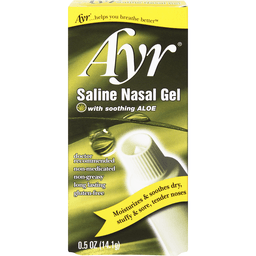 Nasal gel. Cooling. Menthol & eucalyptus. 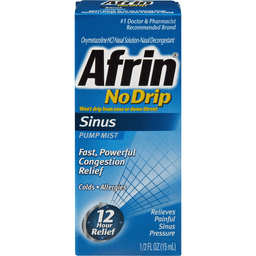 Fast relief of sinus pressure & nasal congestion. Satisfaction guaranteed. Questions? Comments? Side effects? 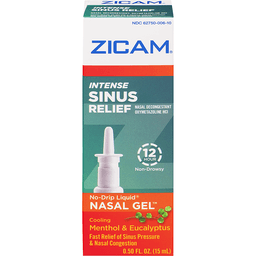 Call 877-942-2626 toll free or visit us on the web at www.zicam.com. Other Information: Store at room temperature (59 degrees - 86 degrees F). Mfd. in the USA for B.F. Ascher & Co., Inc. Foil safety seal over tube orifice embossed with Ascher logo - use cap end to puncture seal. 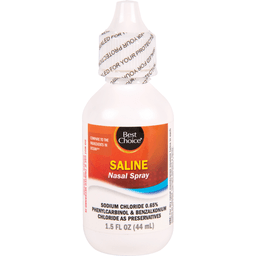 Misc: Relieves discomfort due to symptoms of: colds/flu/allergies; dry nasal passages; nosebleeds. Moisturizes and soothes dry, irritated noses for comforting relief. Doctor recommended. 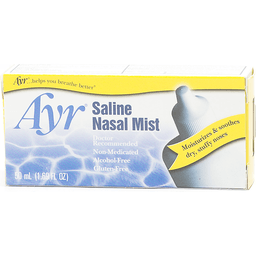 Ayr - helps you breathe better. Paraben free. Gluten free. Questions? Call 1-800-324-1880, 7:30am - 4:00pm Central, Mon. - Fri., or visit us at bfascher.com. Visit our website at bfascher.com.